﻿Aqua ArtMiami, the premier gathering spot for collectors, curators and art lovers to discover fresh talent, is pleased to unveil new works of the Russian Ballet by internationally celebrated artist Kevin Berlin, on December 5-9, 2018, at 1530 Collins Avenue Miami Beach. 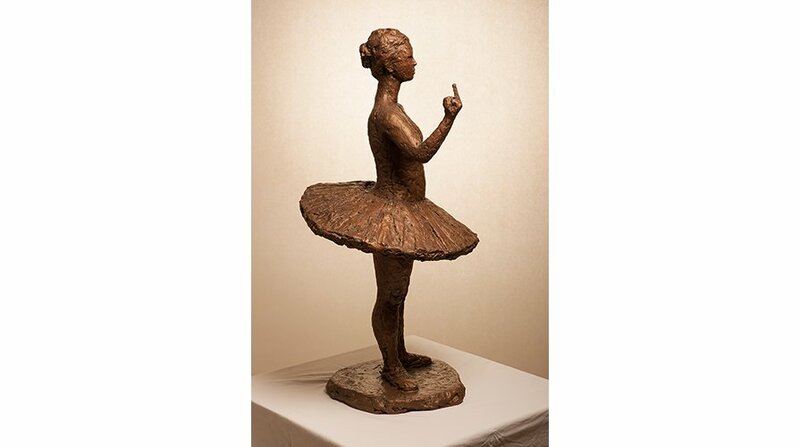 "I am so happy that Kevin is bringing his ballerina sculptures to the AQUA Art Miami fair” said Grela Orihuela, the director of the AQUA Art Miami fair. "The moment I saw the images of him at work on these bronzes in his studio, I knew I wanted the works to be prominently featured at the main entrance of the fair because they are so compelling and provocative. This is the first time they are exhibited and I know our guests will engage with the work, both with the beauty of the sculptures and with the bold ideas they express”. Berlin’s paintings focus on the interior and secret lives of ballet dancers – depicting their hidden thoughts in sensual black and white paintings, sculpture, and works on paper. HOPE DIES LAST stems from time the Artist spent studying ballet dancers in 2015, working from a makeshift studio on Nevsky Prospect in Saint Petersburg, Russia, where he had the opportunity to interview 14 ballet dancers and learn their innermost fears, desires, and thoughts. These new Ballet works reflect the private thoughts not of the Artist, but of the dancers themselves.